Just outside of Calgary sits a small town called Balzac. And in this town, right on the highway leading to and from Calgary, is a relatively new giant shopping mall called CrossIron Mills. I met up with a friend there, and I also went because I wanted to walk around (was hoping to find a lot of good outlet stores, but came away relatively disappointed because this place is mostly just a regular shopping mall). 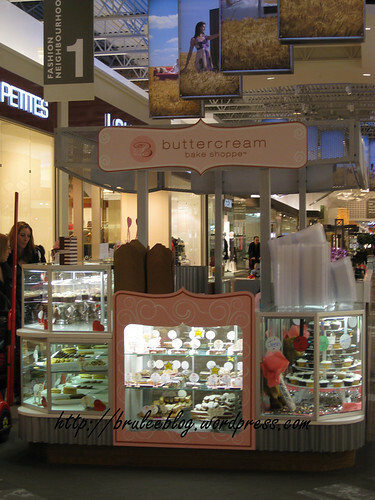 Inside the mall, in the middle of a hallway, is an outlet of Calgary’s Buttercream Bake Shoppe. There were plenty of mouth-watering displays of cupcakes and cookies. I didn’t want a whole cupcake, so my friend and I opted for two mini cupcakes. One was a vanilla cupcake with a passion fruit frosting, and the other was a chocolate cupcake with vanilla frosting. 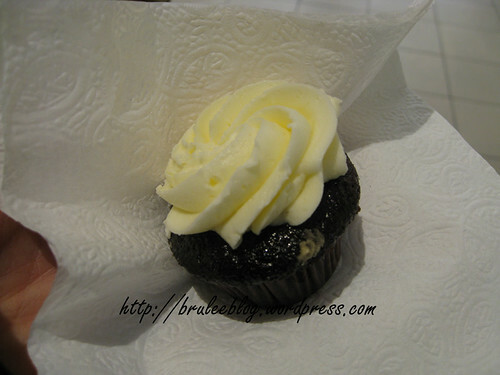 The cupcake itself was just ok – the cake was moist but not as flavourful as I’d like. I think I prefer the cake from Crave. The frosting on the passion fruit frosting was very fruity, and both it and the vanilla frosting were almost too sweet. (I think this is why I don’t eat cupcakes very often. They’re just too darned sweet for me!) The texture of the frosting was excellent though. Creamy, but not so rich that you feel like you’re sticking a piece of fat in your mouth. I think I like their frosting better than Crave’s. I had one of these cupcakes the other day shopping there, and they were ok. Not very flavorful for the cake department and the icing was very nice. I almost didn’t buy one though because the place was filthy. If their small kiosk is that dirty I can only imagine how filthy the actual bakery would be. Oh wow they must have let their standards slip! Ya I don’t know what has happened in the last few months but I have noticed that their locations are dirtier and also I went to order a cake and they had to call me twice confirm the details of the cake. Seems really disorganized. I find their cupcakes AMAZING! 🙂 best cupcake I’ve ever had! Their kiosk was very organized and NOT filthy.